Select these fields from the Actor table. 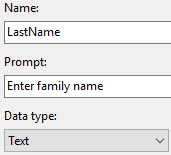 Feel free to use a different parameter name. You can use the Expression Builder to select the parameter rather than type it in. Try Jones, Lee, Fox, Harris, Allen, Smith, Moore, Wilson, Baldwin, Evans or Fonda to return multiple rows. Try your own last name just for the sake of interest. Use the Properties window to find this property. You could also try Nahasapeemapetilon, if you have time to type it. Use the Parameter Properties dialog box to do this. I guess that's one way to remember how to spell one's own name.